The Bhrigu Lake trek takes you across a range of trails, beginning from a simple hike through dense forests and ending with a steep trek over glimmering white snow and ice. As you approach the lake, you'll see a panorama of green, snow-capped mountains dominating the horizon, a mesmerizing view for all trekkers. The lake itself naturally changes from an emerald green pond lined with blooming wildflowers in the summer, to a frozen white sheet with a blanket of snow in the winter. The Bhrigu Lake trek involves climbing over steep inclines, especially on the day when you visit the lake. This moderate intensity trek is perfect for fit and healthy beginners looking for a challenge. The Bhrigu Lake is named after Maharishi Bhrigu, one of the seven great sages in Hindu mythology. The sage is said to have meditated on the banks of this crater-shaped lake and bathed in its cold waters. Trekkers to Bhrigu Lake often mark the first time they see the lake as the most memorable event of the entire trek. En route, the narrow mountain trail, which often throws up interesting challenges, rewards your efforts with sweeping views of the valley, with nearby peaks like Hanuman Tibba and Friendship Peak rising above the landscape. • Sign up for the Bhrigu Lake trek, a moderate intensity trek near Manali. • Climb up over 14,000 feet in the mountains to reach Bhrigu Lake. • Trek through gorgeous, never ending meadows and forests. • Get incredible views of the entire valley from the lake. Travellers are required to follow instructions of the trek leader during the Bhrigu Lake trek. Consumption of alcohol, drugs and tobacco products like cigarettes is strictly prohibited during the Bhrigu Lake trek. Travellers are advised to consult with the trek leader before interacting with local villagers and natives. For cancellations made more than 20 days before departure date of the Bhrigu Lake trek: 80% refund. For cancellations made 20 days or less before departure date of the Bhrigu Lake trek: no refund. The tour operator reserves the right to alter or cancel the itinerary of this Bhrigu Lake trek for the safety of travellers and staff. Unforeseen circumstances such as unpredictable weather conditions may result in a forced change in itinerary. Any costs arising due to such unforeseen circumstances are borne by the traveller. The tour operator takes utmost care to ensure safety of the travellers and shall not be held responsible for any accident or mishap during this Bhrigu Lake trek. Report to Patlikuhal by 7:00 hrs. Here, private cabs arranged by the tour operator will take you to the base camp at Rumsu. After a short time to rest and complete the paperwork at Rumsu, you'll head out to explore nearby villages on a short acclimatization trek. Spend the evening with your fellow trekkers and get to know your trek leader before the big trek begins tomorrow. Overnight in tents at Rumsu. A private vehicle will take you from Rumsu to Gulaba. Your trek to Bhrigu Lake trek begin as you get down from the vehicle at Gulaba and begin ascending on foot. The moderately difficult trail to Rola Kholi takes you over two small river streams with plenty of vantage points to rest and look out over the Solang Valley. Rola Kholi is a large meadow that opens up after trekking through hours of thick jungles. Overnight in tents at Rola Kholi. Set up tents with some of the most photogenic views. Today, you will continue higher from Rola Kholi and trek to the Bhrigu Lake, perched at 14,100 feet on the mountain. The trail presents patches of rough terrain that require strenuous climbing as you gain height. The cloudy weather often presents added challenges. 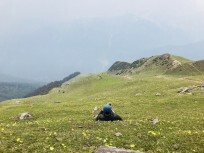 Views of the valley from Bhrigu Lake, however, will be equally rewarding. After an hour spent besides the lake, you'll return back to Rola Kholi. Overnight in tents at Rola Kholi. Trek over sprawling white snowfields on the Bhrigu Lake trek. The easy descent from Rola Kholi to Gulaba gives you the chance to click some photos and get more stunning views before you end the trek at Gulaba. From Gulaba, you'll be driven to Manali in a private jeep. Your Bhrigu Lake trek ends here. Explore open meadows with blooming wildflowers. Hard luggage such as trolley, suitcases etc. Overnight in tents at Rumsu. Arrive at Pathlikuhal and travel to Rumsu in private cabs arranged by the tour operator. Go for an acclimatization walk at Rumsu. You'll be accommodated in tents at Rumsu. Today's meal package includes breakfast, lunch and dinner. All meals served during the trek will include vegetarian dishes only. Jain preparations can be arranged with prior notice. Overnight in tents at Rola Kholi. Drive from Rumsu to Gulaba and trek from Gulaba to Rola Kholi. You'll be accommodated in tents at Rola Kholi. You'll be given a sleeping bag for a restful night's sleep on all days. The high-quality tents and sleeping bags are made to withstand -10 degree temperatures. Today's meal package includes breakfast, lunch and dinner. Go on a day trek to Bhrigu Lake from Rola Kholi. You'll be accommodated in the same tents at Rola Kholi. The campsite will be equipped with common kitchen/dining tent to serve and prepare meals as well as dry-pit style washroom tents. Today's meal package includes breakfast, lunch and dinner. Your trip ends by 17:00 hrs. Trek from Rola Kholi to Gulaba and drive from Gulaba to Manali. Today's meal package includes breakfast only. Patlikuhal is located 16-km/30-min drive from Manali. Local buses and taxis ply between Manali and Patlikuhal. The tour operator's cabs will be waiting at Patlikuhal from 7:00-9:00 hrs on the departure date. The operator will arrange your transport to the starting point of the Bhrigu Lake trek.